Given the fact that conservative health policy advisor Avik Roy and I have disagreed so vehemently and so often, RBC readers might be surprised by the civil conversation we conducted over at healthinsurance.org about Roy’s new health plan. I hope my fellow liberals will read what he has to say–not because you will agree with him, but because he offers an instructive and well-articulated vision of what conservative health policies might look like that build on the platform created in ACA.Â I am a firm believer in Mill’s idea that if you only know your own side of the argument, you really don’t know that. Roy rightly acknowledges that Republicans will not outright destroy ACA at this point. That question was decided by the 2012 election and by the (eventually) successful roll-out of ACA this year. Whatever the polling numbers on “Obamacare,” Â the on-the-ground progress is impressive. Medicaid expansion and the new marketplaces are embedding within the fabric of American life. Where it gets interesting and disconcerting is to note the generative conservative possibilities opened up by ACA. Roy would limit ACA in various ways. But his real quarrel is with Lyndon Johnson not Barack Obama. Once 64-year-olds are enrolled in the health insurance marketplaces, why the abrupt transition at age 65? Roy would raise the Medicare eligibility age by four months every year, retaining the subsidy structures provided by the exchanges and Medicaid. Over time, this would turn Medicare into much more of a means-tested program with dramatically reduced actuarial subsidies to the top half of the income distribution. I don’t support this or see it as politically attractive for Republicans. But Roy’s plan raises fundamental questions about what we want Medicare to be and do. Â More here. A new survey of physicians finds just 7 percent support eliminating fee for service payments, but there’s good news: physicians support improving the quality of care and limiting services that provide little benefit. Rewarding quality of care and reducing unnecessary utilization is exactly the focus of a new bill in Congress to replace the current Sustainable Growth Rate (SGR) which is a formula that determines the annual updates applied to Medicare physician payments. The current bill addresses a significant flaw in the SGR: payment updates are applied uniformly and nationally, regardless of individual or practice parsimony/excess. Originally, back in 1989, policy experts discussed the possibility of disaggregating the expenditure targets and updates by region (as it is in some countries), but that never happened. So, acknowledging that the SGR is an imperfect cost containment mechanism, at least the SGR does try to reward providers when costs are contained, and correspondingly reduce fees when expenditure targets are exceeded. The latter situation is uncomfortable for all however; inÂ practice, cost-containment is hard to do. Â The payment update was supposed to fluctuate like a thermometer, based on success in meeting Medicare expenditure targets. When the thermometer is forecast to dip below zero, there is pressure on Congress to stop the mercury falling. Â Here is an alarming videoÂ advertisement prepared by the Texas Medical Association that gives you a flavor of that pressure. Granted, 25% cuts are too large, but the cuts get more extreme precisely because Congress forestalled prior year cuts–something that is not made clear, as if the cuts today have little to do with the past. Â As I have argued previously,Â Â the problem is that Congress is like Ulysses and the Sirens. Congress is unable to resist intervening if there are cuts likely. The bottom line: provide individual or practice-based updates for higher quality and cost-effective care. If that fails to hold down expenditure, Congress needs to let payment updates go upÂ andÂ down in order for the incentives to work. [Residency] programs turn out too many specialists who go on to practice in places where such doctors are already in oversupply, and where, according to numerous studies, they often inflate health care spending by engaging in massive amounts of unnecessary surgery and other forms of over-treatment. Meanwhile, residency programs are producing a dwindling number of primary care physicians and other generalists, who are already in chronically short supply in most parts of the country and are desperately needed to implement the kind of reforms to the health care delivery system necessary to improve its quality and efficiency. Longman believes that putting conditions on the medical training subsidy is a good way to force residency programs to train more primary care docs. I agree with much of what Longman says, but doubt that this is where the public policy leverage truly resides. The preference of many aspiring doctors-to-be and academic medical centers for specialist training has little to do with the subsidy for residency training and a lot to do with specialist care being reimbursed at a much higher rate than primary care. Until that is changed, tinkering with the comparatively small amount of money that is devoted to medical education ($19 billion) is not going to motivate much reform in a three trillion dollar health care system. I raised this in a friendly email exchange with Longman, and he helpfully directed me to another essay on this very point in the same issue of Washington Monthly. In it, Haley Sweetland Edwards makes the case that the reason why specialist care is so much more richly compensated than primary care is simple: The reimbursement rates are set by a Medicare advisory committee composed largely of specialists. Charges, payments and costs, oh my! CMS last night released 2011 data on the charges and payments for the 50 most common hospital discharges for every hospital in the USA (Aaron McKethan put me onto this via twitter @A_McKethan). A quick primer and then selected comparisons for UNC, Duke and Wake Med hospitals. Charges are a fantasy amount that no third party insurance company would ever pay. However, the uninsured might pay this amount (they would often be ‘charged’ this amount and go bankrupt trying). Payments are the amount that is actually paid for care (in the data released it is combined amount paid by Medicare, other insurers, and patients). Cost is a truly elusive concept in health care, but hospitals of course have systems that state their costs (and likely have many versions depending upon what is included). Author Don TaylorPosted on May 8, 2013 Categories Everything ElseTags Affordable Care Act, Hospital prices, Medicare14 Comments on Charges, payments and costs, oh my! 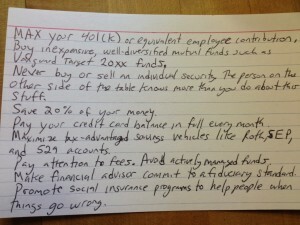 Alex M commented on my last post: What *is* this simple free best personal finance advice that fits on a 3Ã—5 card? Itâ€™s kind of a tease to say itâ€™s so easy and then not go ahead and spell it out in twenty seconds. Addendum: Rights to this picture belong to Harold Pollack. My book with Helaine Olen, based on the card, may be found here and here. This picture may be reproduced on a blog as long as my ownership is acknowledged and a link is posted to the original and to one of the above two book links. The President mentioned being open to Medicare reforms of similar cost magnitude to those proposed by the Simpson-Bowles report in the State of the Union last night. While this issue has long been on the radar of elder/disability advocates, it never made it into the popular culture as a political issue. Why? I think it is related to the fact that long term care and disability are the underside of the health care system and people don’t like to think about needing rehab just to be able to maintain their ability to swallow, for example. Not an attractive thought. Imagine if Medicare announced that chemotherapy X to treat Cancer Y would only be paid for if you could prove it was extending your life. The internet and the health policy meets political corner of twitter would break. We turn in horror from looking at long term care, but run toward the potential denial of a curative therapy and have a group freak out (sorta like ‘rubber-necking’ at a bad car wreck). It doesn’t bother me and I even like the fact that the question of ‘can/is this person benefiting?’ from rehab services is being asked. It is a policy question as to whether such care should be required to bring about improvement, or simply to maintain function. I think the case has now been rightly decided toward expansiveness of these services. However, the same type of bright lights (does it extend life, improve function, how much does it cost?) should be asked of the entirety of the Medicare program. Not just the parts no one likes to think about. A new poll shows that raising the Medicare age slowly to 67 (presumably to unify it with the Social Security full retirement age) is not popular. It is a bad idea in policy (TIE FAQ is good) terms because all you are doing in a state with an exchange and a Medicaid expansion is mostly shifting the healthiest Medicare beneficiaries into a smaller risk pool so it will be more expensive. In a state without a Medicaid expansion, you will get more uninsured near poor who are likely to have relatively high needs due to age. I have often said it is also a near certainty that we will do this (raise the Medicare age) some day because for many Republicans it sounds like “fundamental reform” and they haven’t shown themselves to have so many ideas on what to actually do in health reform, and certainly not the political will to push them. Raising the Medicare age to 67 remains popular with conservatives because it is a simple idea that seems consequential in ways that they assume will reduce spending, and seems bold. As the FAQ above shows, that is not really true, but this idea remains front and center for many. Pardon the most boring title in the history of RBC. Deep cuts to Medicaid, accompanied by a block grant structure which shifts costs and risks away from the federal government and onto individuals, states, and local governments. Repealing health reform, and thus forestalling both the Medicaid expansion and the range of protections and subsidies embodied in health insurance exchanges. Transforming Medicare from a defined-benefit to a voucher program in which traditional Medicare competes with private plans. Congratulating themselves for making hard choices on entitlements while simultaneously appealing to the over-55 Republican base by hammering the Democrats over the $716 billion in Medicare payment cuts included in the Affordable Care Act. The first two pillars remain in place. For all the criticisms of Governor Romney for his vagueness, his approach to Medicaid and health reform are all too clear. Repealing health reform will result in roughly 30 million Americans going uncovered who would otherwise be insured. â€œRepeal and replace,â€ along with the block- granting and cutting of Medicaid will reduce federal support for Medicaid by roughly one-third a decade from now, maybe more…. WSJ has a debate on raising the Medicare age featuring Maya MacGuineas (yes) and Aaron Carroll (no).